Barcelona is the capital city of Catalonia in Spain. There is a thriving bar and restaurant scene as well as numerous attractions for the tourist visitor. To make the most of your trip, you’ll want to look over our budget hotels in Barcelona and find somewhere great to stay as you explore this amazing city. 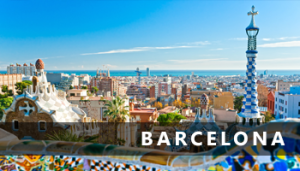 There are many sights for the tourist itinerary from Montjuïc and the excellent Joan Miró museum to the amazing architecture of Antoni Gaudí, culminating in his unfinished Sagrada Familia church. Barcelona is a city on the sea. It has beaches and seaside bars and restaurants. The city is compact and easy to get around. The main tourist areas of Las Ramblas, Barri Gotic and Barceloneta are all walkable. In fact, a stroll from Plaça de Catalunya down the famous Ramblas with its market stalls and street entertainers is not to be missed. For the sights further afield there are regular (and competing) city bus tours in double deck buses as well as an efficient metro system. There are hotels to be found in Barcelona for every category and for every budget. You will find luxury 5 star hotels such as Hotel Arts and the W Hotel Barcelona on the edge of trendy Barceloneta. Mid-range business-type hotels tend to be located on Ave Diagonal and L’Eixample district and often have discounts on weekends and in high summer. Abba Sants Hotel is near the major Sants railway station. The 3-star Europark Hotel Barcelona in L’Eixample is highly rated by visitors. Budget travellers have a choice of smaller, family-run hotels and hostels near the city centre. Sant Jordi Hostel Rock Palace is highly rated, as is the 2 star Hotel Cortes in the Barri Gotic. Barcelona’s busy cruise port is not far from the city centre and most central hotels are only a short cab ride away. The airport is connected to the city centre by frequent express buses or a less frequent train (from Terminal 2B) to Placa Catalunya. Search our listings of budget hotels and cheap hotel deals in Barcelona for instant availability and live pricing. We guaranteed the lowest available online price.